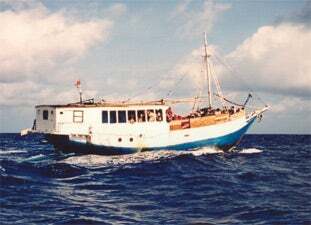 "On Friday 2 November, 2001, the Sumber Lestari, a coastal trader type vessel of approximately 20 metres in length with a beam of approximately 6 metres and a draft of roughly 2.5 metres, left Surabaya, Indonesia with a crew of 4 Indonesians and 160 asylum seekers. The intended destination of the Sumber Lestari was Ashmore Reef, where the crew intended to offload their clients before making a run for home. At about 3.20pm on 8th November, 2001 the Australian Customs vessel Arnhem Bay, a 35 metre patrol boat licensed to carry 28 people, sighted the Sumber Lestari a short distance outside the Australian contiguous zone off the coast of Ashmore Reef. The contiguous zone is an area of 24 nautical miles from any portion of Australian territory. Within this zone, the Commonwealth has certain legal rights and responsibilities, particularly in relation to people smugglers and asylum seekers. At 3.41pm the commander of the Arnhem Bay, Bradley Mulcahy, addressed the Sumber Lestari by loud hailer, requiring it to heave to so that a warning notice could be issued. There was no change in course or speed so the captain directed a boarding party to go by tender to the Sumber Lestari and hand a notice in Indonesian to the ship's company. This was effected at about 3.56pm when the notice was accepted by a person on board the Sumber Lestari who then handed it to a person in the bridge. Shortly after the notice was delivered those aboard the Sumber Lestari were addressed by one of their number, who spoke to them on the foredeck. This person appeared to be one of the asylum seekers rather than a member of the crew. Those on board seemed to respond to what that man had to say by taking up position on the foredeck and putting on life jackets. Preparations to disable the Sumber Lestari also appear to have been made during this period with noise travelling to the customs vessel suggesting that those on board were endeavouring to incapacitate it. At about this time, (4.30pm) the HMAS Woolongong, a 45 metre patrol boat, arrived in the vicinity and took position off the Sumber Lestari's starboard quarter. It had orders, once the Sumber Lestari had passed into the Australian contiguous zone, to board the vessel and take it to Ashmore Island so that those on board could be appropriately processed. The commanders of both the ACB Arnham Bay and HMAS Woollongong seemed to have been deeply concerned that a SOLAS (Safety of life at Sea) situation may arise. Their concerns seem to have arisen as a matter of common sense, past experience and what they could objectively observe. Both commanders noted that objects were being thrown over the side of the Sumber Lestari, that fuel was being pumped overboard, that there was hammering emanating from the hull and that some of the material jettisoned overboard consisted of planking that was of the same colour as the Sumber Lestari's hull and deck. The logical inference that both captains drew was that those on board the Sumber Lestari were preparing to damage or sink their vessel thereby forcing the Australian authorities to rescue them and process them as asylum seekers, rather than force their vessel back to Indonesian waters thereby frustrating their attempt to be being dealt with as refugees. Lieutenant Commander Heron, commander of the HMAS Woollongong, who was preparing to deploy a boarding party to take control of the Sumber Lestari and to prevent a SOLAS situation developing, had real reason to be concerned that he was sending his crew into a hostile environment. He had been advised that a knife sheath had been thrown overboard from the Sumber Lestari and recovered by the crew of the Arnham Bay. Notwithstanding the risk to his own personnel he ordered them to approach the Sumber Lestari and board it. The boarding party, under the command of Lieutenant Commander Robert McLaughlin, approached the Sumber Lestari at about 4.48pm. The first four members of the boarding party succeeded in getting aboard the Sumber Lestari and were making their way towards the bridge to take control of the vessel. Very shortly after they arrived, and before they were able to reach the bridge, an explosion took place in the forward hull. This occurred at approximately 4.49pm. Smoke was very quickly thereafter noted to be pouring out of the hold. The explosion caused panic amongst the crew and passengers on board the Sumber Lestari. The crew appeared to abdicate all responsibility for the situation and did nothing of any significance to assist their passengers. Furthermore their vessel was particularly ill equipped to respond to a disaster situation. It lacked any basic safety systems such as fire fighting equipment and life rafts. Furthermore the life jackets that the crew had handed out at the beginning of the voyage were largely of a poor quality. As noted the explosion caused panic amongst those on board, most of whom jumped into the ocean with whatever additional means of buoyancy they could lay their hands on. This included the two deceased, Fatimeh Husseini and Nurjan Husseini. Both the Arnhem Bay and the Woollongong launched tenders to uplift the survivors. Within a period of approximately 30 minutes all 164 people who had been onboard the Sumber Lestari had been recovered. [Note : It would appear from records that this period may have been closer to 50 minutes, the Arnhem Bay log records at 1650 "persons in water" and at 1743 "all persons out of the water"]. Two young children who were taken on board the Woollongong, required medical assistance, but recovered. Regrettably, two women did not survive the ordeal. Nurjan Husseini - approximately 55 years of age. Mrs Husseini was an elderly woman fleeing from Afghanistan in search of asylum in Australia. She and her family had made a lengthy and expensive trip from their remote village in Afghanistan to Surabaya, Indonesia where they joined the Sumber Lestari. This trip had been arranged by a series of people smugglers along her route. After the explosion on board the Sumber Lestari her family, with whom she was travelling, lost sight of her. It appears that wearing a life jacket, she had preferred to take her chances in the water rather than risk staying on board the fatally wounded Sumber Lestari. She was seen in the water by another asylum seeker, a young man, by the name of Ali Reza Sadeqi, who noted that her life jacket was supporting her face down in the water and that she was not moving. He very bravely swam towards her, pulled her face out of the water and noticed she was not breathing. Mr Sadeqi, to use his own words, "pushed her chest and tummy in". Some foam and water came out of her mouth and he says that he thought she started to breathe but could not speak. Mr Sadeqi, together with Mrs Husseini made his way slowly towards the Arnhem Bay. He was struggling to hold her up and to keep her head out of the water and believes that Mrs Husseini was breathing. Upon reaching the boat, at about 5.10pm, Mrs Husseini was hauled aboard by the captain, Bradley Mulcahy with the assistance of Ivan Carapina. They were joined by a level 2 officer, Arthur Mahoney, who conducted a medical check and determined that Mrs Husseini had no pulse and was not breathing. Officers Mahoney and Carapina initiated CPR and EAR in an attempt to resuscitate Mrs Husseini. Their efforts were not rewarded and ceased after approximately 14 minutes - at 5.24pm. This was after a medical orderly from the Woollongong, Petty Officer Craig Duff, had boarded the Arnhem Bay and determined that nothing more could be done to assist Mrs Husseini. Fatimeh Husseini - approximately 20 years of age. Like Mrs Nurjan Husseini - who appears to have been unrelated - Fatimeh Husseini had fallen into the hands of people smugglers who had promised to transport her and her husband Seyyed, from their remote village in Afghanistan to Australia. Theirs was a lengthy and expensive attempt to reach our shores. After the explosion Mr Husseini urged his wife, who was wearing a life jacket, to jump into the water but she was scared and crying and told her husband that she wouldn't and that she was afraid. The position was plainly unsafe and one of the members of the boarding crew urged them to jump into the water. This seemed to overcome Fatimeh's reluctance and she and her husband jumped into the water together, holding hands. After jumping in they became separated and Mr Husseini did not see his young wife alive again. One of the navy tenders sighted Fatimeh's body in the water. She was wearing an orange life jacket which was fitted loosely. She was supported on her back with water just covering her face. Able Seaman Daniel Walsh, with the assistance of some of the asylum seekers who had already been recovered by the tender, hauled Fatimeh on board. Mr Walsh put Fatimeh into the recovery position and checked her airways. As he did this approximately one litre of white froth and water was expelled from her mouth. He checked for signs of breathing or chest movement but detected none. Similarly, he checked for a carotid pulse and radial pulse to no avail. As a precaution, he again checked the carotid pulse and suspected he had felt a faint indication of life. The tender quickly made its way back to the Woollongong during which time Mr Walsh's suspicion of an 'indication of life' was radioed back to the Woollongong so that its medical personnel could prepare themselves and be on standby. After that radio message was transmitted but before the tender arrived at the ship Mr Walsh again checked the carotid pulse - the only indicator of life - and found that there was none. He noted that her skin was cold, very pale, almost white. Fatimeh's body was taken on board the Woollongong where she was taken into the wardroom. Extensive efforts to resuscitate her were carried out by Messrs Mooney and Zanker, including CPR, EAR and the use of the oxy viva. Their efforts were unsuccessful and ceased at 5.49pm, 28 minutes after arriving on the Woollongong (5.21pm). The four Indonesian crew members were transported to Australian territory where they were successfully prosecuted for people smuggling. They received sentences ranging from 9 months for a junior crew member to seven years six months imprisonment for the Captain, Mr Beli, a repeat offender. The surviving asylum seekers were split into two groups; one of which stayed on Chrstimas Island whilst the others were transported to Nauru". The Inquest was held in order to examine the circumstances of the deaths and to receive evidence in relation to a number of issues relating to those deaths. On Thursday 8 November, 2001 the Australian Customs Service Vessel ACV Arnhem Bay, which had been in the Ashmore Island group, departed an outer lagoon for a patrol to the north of the Ashmore Islands. At 2:52pm radar contact was made with a vessel which subsequently was discovered to be the Sumber Lestari. The ACV Arnhem Bay proceeded to investigate the vessel and at 3:20pm the vessel was sighted. The Sumber Lestari was identified as an Indonesian motorized wooden hulled vessel, approximately 20 metres in length. With the use of binoculars the name "Sumber Lestari" was made out on the front of the bridge. At that stage Officer Mulcahy, the Commanding Officer of the Arnhem Bay, could see approximately 40 persons, most of whom were wearing life jackets, on the forward section of the Sumber Lestari. More persons could be sighted inside the vessel. At 3:41pm Officer Mulcahy used a loud hailer and called out to the vessel requiring it to heave to for the issue of a warning notice. The vessel continued heading towards Ashmore Islands at approximately 6 knots. At 3:46pm one of the tenders on the Arnhem Bay was lowered and went to the vessel with a warning notice was handed to a person on the boat. The warning notice advised that it was an offence to bring persons illegally into Australia and that the vessel should turn back. At about 4:13pm the HMAS Woollongong came within sight. At about 4:16pm a Rigid Hull Inflatable Boat (RHIB) was launched from the Woollongong and approached the Sumber Lestari. After the arrival of the customs vessel in its vicinity the Sumber Lestari had accelerated and increased it speed to about 7 knots. At 4:34pm its engines stopped and diesel fuel could be seen being discharged from the portside of the vessel leaving a slick trailing into the sea. It would appear that this diesel had been pumped out through the bilge. At that stage the vessel was not in the Australian Contiguous Zone, but at 4:48pm information was received that the vessel was within the Contiguous Zone and the HMAS Woollongong boarding party moved alongside of it. During this period Customs Officer Arthur Mahoney recorded many of the events using a video recorder. At approximately 4:50pm the vessel was seen to be on fire and people from the vessel were seen jumping into the water. The Australian Customs Vessel tender, which was nearby at the time, commenced retrieving people from the water and immediate steps were then taken to launch the second tender. The HMAS Woollongong tender returned its boarding party to the Woollongong, after which it returned to where people were in the water and assisted with saving persons who were in the sea. Officer Mulcahy directed one of the customs tenders to proceed to the burning vessel to remove any person remaining on board. Officer Mulcahy also positioned the customs vessel, ACV Arnhem Bay, so that it was in the line of persons drifting in the sea. Both customs tenders and the HMAS Woollongong tender continued retrieving people from the water and placing on the two larger vessels while a number of persons were retrieved from the sea directly onto the main customs vessel where Officer Mulcahy was stationed on the aft platform. At about 5:10pm Mr Ali Sedequi with Mrs Nurjan Husseini arrived at the side of the customs vessel and Officers McCulahy and Carapina pulled her out of the water. Officer McCulahy called out to Officer Mahoney, who had completed advanced first aid training, to assist and he called out that there was no pulse or breathing. CPR was commenced on the dive platform and subsequently Officers Mahoney and Carapina moved Mrs Husseini onto the aft deck where they continued with CPR. While attempting to assist the deceased on the dive platform, Officer Mahoney noticed that there was a continual stream of fluid coming from her mouth. Officer Mahoney requested assistance by radio from a medic from HMAS Woollongong and at about 5:23pm Petty Officer Duff from the HMAS Woollongong arrived. Petty Officer Duff had significant medical training and experience and at 5:24pm instructed Officer Mahoney to cease CPR. While Officer Mahoney had completed a senior first aid course and an advanced CPR course, he had not previously been required to perform CPR in an emergency and so, although he believed that the lady on whom he was working was dead on arrival, he continued with every effort in the hope that she might be resuscitated. In the case of Officer Carapina, when the deceased was first moved on the deck he looked for a face mask to assist with EAR within the vessel, but could not locate one. While he was looking for the face mask, Officer Mahoney conducted EAR and CPR. At the time of the incident, the Commanding Officer of the HMAS Woollongong was Lieutenant Commander Wesley Heron. The HMAS Woollongong is a Fremantle Class Patrol Boat. At about 4:13pm Lieutenant Commander Heron gained visual contact with the Sumber Lestari and Arnhem Bay and at about 4:20pm the vessel took up position at the Sumber Lestari's starboard quarter. At 4:45pm Lieutenant Commander Heron received orders that they should board the Sumber Lestari and secure the engine room in order to take the vessel to Ashmore Island. The information was relayed to the boarding party under the leadership of the Executive Officer, Lieutenant Commander Robert McLaughlin. As the boarding party were approaching the Sumber Lestari in their RHIB they observed fuel being pumped over the side of the vessel with a large rainbow slick covering the area around it. They also observed objects being thrown over the starboard side. Lieutenant Commander McLaughlin heard hammering noises coming from the Sumber Lestari as he approached it and several large planks of wood were thrown into the sea. The boarding party experienced considerable difficulties in attempting to board the vessel because at that stage its engines were not going and it was side on to the sea and rolling heavily. In addition there was temporary planking above the deck of the vessel with planking over the access point. When Lieutenant Commander McLaughlin finally reached the deck of the vessel he saw smoke coming out of a large access space in the middle of the forecastle which lead down to an empty hold. He dispatched Petty Officer Phelp, another member of the boarding party and an engineer, to go to the hold to determine what was happening with the engines. When Petty Officer Phelp had gone 2-3 steps down the ladder, there was an explosion in the hold, and the amount of smoke began to increasing markedly. At that stage Petty Officer Phelp was immediately taken off the ladder and brought back on deck. At that time there was a large amount of black smoke and a fire developed rapidly. A number of persons on the vessel then began to panic and rushed to the starboard side of the vessel, which began to list dangerously to starboard. Some persons jumped overboard at that time. Lieutenant Commander McLaughlin became extremely concerned that the vessel would capsize and he instructed other officers to herd some of the people over to the port side. At about that time Able Seaman Walker, another of the boarding party, found two large containers of water and efforts were made to penetrate the containers in an attempt to flood water into the hold to fight the fire. Unfortunately these efforts were unsuccessful. The smoke began increasing and became thicker and darker. Large flames were also visible in the hold. At that stage approximately two thirds of the passengers had left the Sumber Lestari and the smoke had become quite choking. Lieutenant Commander McLaughlin determined that the boarding party should leave the vessel and Petty Officer Yardley, another of the boarding party, called "Recoil" - the code word for an emergency extraction of a boarding party - into the radio. The naval officers kicked down part of the forward railing to assist with speedier evacuation of the vessel and then jumped into the water and swam to the RHIB. Once all members of the boarding party (6) in addition to the driver of the RHIB and the bowman and one person from the vessel were on board, the RHIB returned to the HMAS Woollongong where the boarding party disembarked and Lieutenant Commander McLaughlin, together with two other officers, took the RHIB back to collect people out of the water. In my view the action by the boarding party in taking some time to remove timber boards from the sides of the ship to assist passengers to leave the vessel, in attempting to calm the passengers and give them advice in relation to jumping into the water and re-directing them within the vessel and in attempting to release water and to generally save the vessel, demonstrated considerable courage and concern for all of those on board. Particularly in circumstances where there was a concern that efforts may have been taken to sabotage the vessel, there was certainly an element of risk to life in carrying out these activities which were performed to save those on the vessel. The HMAS Woollongong had two tenders, one the RHIB, which had soft sides of inflatable rubber and which was able to pick up persons from the water quickly, and a light utility boat (LUB). The LUB was an aluminium sided vessel, which was not well suited for retrieving persons from the water. The LUB had relatively high sides and was also relatively unstable when efforts were being made to pull a person out of the water. The LUB was a suitable tender for use in reef conditions where its strong sides would be of advantage, but it was not well suited to a rescue operation in open seas. The LUB was also relatively difficult to launch because of its location on the HMAS Woollongong. After a period, however, a decision was made that officers could be released from other tasks to launch the LUB which was then used to assist the other tender vessels. Approximately 4 people were recovered from the sea onto the LUB when Fatimeh Husseini was located, at that stage on her back with water just covering her face. Fatimeh Husseini (the deceased) was loosely wearing an orange life jacket. Able Seaman Walsh pulled her onto the LUB with the assistance of one of the passengers from the Sumber Lestari and when she was on the LUB he checked her airway. At that time approximately 1 litre of white froth and water came from her mouth. There was no chest movement and no evidence of a carotid pulse. Able Seaman Walsh checked for a radial pulse without success although at one stage he believed that he may have felt a faint radial pulse. He then again checked for a carotid pulse without success. The LUB then proceeded back to the HMAS Woollongong where the deceased was recovered onto the ship using the recovery strop. CPR and EAR were then provided to the deceased by Officers Zanker and Mooney and on his return to the HMAS Woollongong Petty Officer Duff also attempted to assist her. The deceased at that stage was unconscious with no breathing or pulse detected. Resuscitation had been attempted for some 20 minutes by the time of Mr Duff's assessment. Mr Duff arranged for an officer on board the HMAS Launceston to be contacted for guidance and he was advised by that officer, Officer Plant, that he should recommend to the Commanding Officer that resuscitation should cease. On receipt of that advice a decision was made to cease resuscitation which took place at 5:45pm. The LUB subsequently broke down, after having gone out to retrieve persons from the water on only two occasions. Ali Sedequi gave evidence essentially along the lines outlined by counsel assisting in his opening speech. He spoke of his own past history which included serious mistreatment directed towards him by the Taliban in Afghanistan, after which he had travelled to Iran, Malaysia and Indonesia. Mr Sedequi had been living out of Afghanistan for almost a year until the time when he went on the Sumber Lestari to travel to Australia. Mr Sedequi had purchased his own life jacket, having heard news of another incident when a boat had sunk causing considerable loss of life. Mr Sedequi was not aware of any efforts to sabotage the Sumber Lestari and he stated that he did not believe that the fire had been started deliberately. In his view to start such a fire deliberately would be insane because of the amount of fuel which was stored on the vessel. Mr Sedequi claimed that the Navy Vessel had cut off their boat by coming across directly in front of it and he also claimed that the canon on the Navy boat had been turned towards their boat [t.316]. His evidence was inconsistent with the evidence of Lieutenant Commander McLaughlin who indicated that it would not be sensible seamanship to cut across the bows of another vessel and who stated that no naval officer was manning the gun at the time [t.425]. I do not accept Mr Sedequi's evidence on this point, particularly in the light of the evidence of Lieutenant Commander McLaughlin and the evidence of a number of other witnesses as to the paths taken by the various vessels. Mr Sedequi also claimed that he was in the water for at least 1 hour and that for a period of 30-40 minutes no effort was made by Naval or Customs Officers to save persons in the water. In the light of detailed evidence as to the timing of events I do not believe that Mr Sedequi was in the water for a period as long as 1 hour and while there might have been some short delay before the process of rescuing persons from the water commenced, I do not believe that there was any delay in the order to 30-40 minutes. It should be noted that 164 people including children were lifted from the water within a period of about 50 minutes. It should also be noted that the task would have been made particularly difficult because of the fact that a number of persons in the water were panicking and very few appeared to have been able to swim. It is clear that the experience would have been a particularly unpleasant and frightening one for Mr Sedeqi and this factor may have made the time which he spent in the water seem much longer than it was actually was. The position in relation to Mr Sayyed Husseini and Mr Musa Husseini, who both gave evidence, was a particularly sad one as both men have lost persons very dear to them and have gained nothing as a result. Both are to be returned to Afghanistan. In Mr Sayyed Husseini's case he lost his wife to whom he had been married for 1 years before they left Afghanistan. Mr Musa Husseini has lost his mother. It is clear that both men were mislead as to the condition of the vessel on which they were to travel to Australia. Mr Musa Husseini had been told that the vessel was a very good boat and that they would be provided with food and excellent amenities. In fact the boat was leaking from the outset, there was not enough food and no bedding. Life jackets were provided by the crew of the vessel to the passengers but these were clearly of very poor quality. The life jackets, one of which was viewed at the Inquest hearing, were inadequate with very poor floatation qualities and provided little assistance to those in the water. It would also appear that both of these witnesses had received confused messages as to what to expect in Australia, and did not expect to be detained and sent back to Afghanistan. Both would never have attempted the terrifying and disastrous voyage in question had they been accurately informed as to the situation. There is a body of evidence which would suggest that the fire was deliberately lit. There is also the evidence of Mr Beli, the Captain of the Sumber Lestari, who claimed that he was in the wheelhouse with the other Indonesians when the Australian ships intercepted the Sumber Lestari and that passengers surrounded them. He said that he believed that some of the passengers damaged the engine and also damaged his magnetic compass. He claimed that he saw the engine battery being thrown overboard. Mr Beli believed that the fire started in the engine room and he believed that one of the passengers must have started it. Mr Beli was not called as a witness and he clearly had good reason to provide an account favourable to himself. There was also evidence to the effect that a father of children who were assisted after the incident, who had been a passenger, told Petty Officer Duff that the fire had been started by Iranians. On the other hand, after the incident one of the persons from the vessel told Petty Officer Bosan Yeardley "Iraq set boat on fire not Afghan [sic]". Of particular relevance in this context, however, is the timing of the events. It would appear that as soon as the Naval Officers commenced to board the vessel, the fire broke out. It is also particularly relevant that the engines of the Sumber Lestari had not been going for about 15 minutes when the fire broke out and so heated engine points were unlikely to be the ignition source of the fire. While it was the evidence of Officer Zanker that the flash point for diesel vapour is 61.50C, a much higher surface temperature on any metal machinery would be required to ignite diesel vapours. In testing conducted in relation to another vessel, while a flash point for diesel stored on that vessel was determined as 710C, fuel in contact with a metal box did not ignite until it had reached a temperature of 3100C or higher. It would seem very likely, therefore, that a fire was deliberately started. Whether or not the fire was intended to ignite diesel stored on the vessel and cause a very dangerous situation for all on board is another question. It is very clear, however, that the families of the two deceased women were not near the engine room at the time when the fire started, none of those family members had anything to do with the fire and it is further clear from the evidence of Mr Sayyed Husseini and Mr Musa Husseini, that none of their family members would have had any part in such an action. If the Sumber Lestari was deliberately set on fire, it is clear that the person who did so had little regard for the safety of those on the boat, particularly in a context where there was a large amount of fuel stored on board. On 8 November, 2001 the two deceased women, Nurjan Husseini and Fatimeh Husseini, died as a result of Immersion. The cause of death in each case was determined following post mortem examinations conducted on 16 November, 2001 by forensic pathologist, Dr K A Margolius, who concluded that the medical cause of death in each case was Immersion. Both women came from Afghanistan and had not learned to swim. Both deceased persons were forced into the water as a result of the vessel on which they were travelling to Australia, the Sumber Lestari, having caught fire. While it would appear that the fire on the vessel may have been deliberately lit, neither woman had any part in lighting the fire and both were innocent victims. Indonesian crew members on the Sumber Lestari had provided both women with deficient life jackets, there were no life rafts on the boat and the crew did nothing to assist after the fire started. The attitude of the people smugglers involved to the passengers on the vessel was grossly irresponsible. In the case of both deceased persons, their bodies were recovered relatively shortly after their deaths and every effort was made to resuscitate them by Naval and Customs Officers. Australian Federal Police are still conducting investigations to determine who, if anyone, caused the fire and whether charges relating to the deaths may be laid. In these circumstances it is possible that the deaths arose by way of unlawful homicide or by way of accident and I make an Open Finding as to how the deaths arose. Following the deaths there have been reviews conducted both by the Australian Customs Service and the Royal Australian Navy into the events and a number of lessons appear to have been learned. On 16 November, 2001 Officer Mulcahy, the Commanding Officer of the AVC Arnhem Bay, prepared a document (Exhibit "8") reviewing the events and making a number of recommendations. A large number of the persons who were saved from the water were women, children or frail persons who had difficulty embarking on the Arnhem Bay. It was Officer Mulcahy's view that a larger scramble net than the one carried at the time would have assisted in bringing those persons onto the vessel. Officer Carapina looked for a face mask and was unable to locate one at the time when CPR and EAR was being conducted on Nurjan Husseini. Face masks of this type offer protection to the user and assist in the provision of air. It was the recommendation of Officer Mulcahy that pocket face masks should be provided in easy access areas around the vessel. It was Officer Mulcahy's view that a minimum of 10 and possible 12 fully trained crew were required to carry out rescue procedures. The ACV Arnhem Bay had 9 crew at the time who experienced difficulties in a situation when there were 2 tenders in the water and other officers were involved in the retrieval of persons directly from the water onto the vessel. A secure short range portable communication system which would be compatible on both Royal Australian Navy and Australian Customs Vessels would assist in allowing for reliable and secure communications during emergencies and should be used. Particularly in a context where there is regular communication between these organisations on combined operations, such a system would of obvious benefit. Man overboard drills, involving simulated mass rescue, would be of assistance, particularly if both Naval and Customs officers were to be involved. All of these recommendations appear to be very much merited by the events of 8 November, 2001 and their implementation is supported. 1. That life jacket toggle langyards be lengthened on Naval Life Jackets because in the incident toggles worked back into the jackets and were difficult to pull causing problems for members of the boarding party in inflating their jackets. 2. That a two piece lightweight boarding suit should be prepared for use by boarding parties which would replace present heavy overalls and boots which caused problems when members of the boarding party had to jump from the Sumber Lestari into the sea and swim to the RHIB. 3. That the communication system be improved using a system which would work after being immersed in water and could be easily clipped onto webbing leaving hands free for boarding parties. 4. That the number of medical oxygen cylinders be increased because at the time of the incident there were only 4 oxygen bottles available on board, which required prudent management in the event that a number of casualties would require oxygen treatment. 5. That the second tender, the LUB, should be replaced by a boat more suited to recovery of persons from the water. This has in fact already taken place and a zodiac has replaced the LUB. 6. That there should be more interaction between Customs and Naval Officers during exercises, particularly exercises directed to mass rescue operations. Again each of these recommendations was merited by the evidence and to the extent that they have not yet been implemented, I support the taking of action to ensure their timely implementation. While Mr Sayyed Husseini and Mr Musa Husseini had no real criticism of the Australian Navy or Customs Service in relation to the rescue operation and were grateful for small kindnesses which had been provided to them on their arrival in Australia, Mr Sayyed Husseini did, however, express concern about the length of time involved before he was notified about the death of his wife and also as to the manner in which that information had been imparted to him [t.386-387]. While I accept that the priorities for Naval and Customs officers concerned at the time related to the safety and health of those who had been rescued and there were a large number of tasks required of them including provision of food, clothing etc it is possible that the great distress which was being experienced by Mr Sayyed Husseini at the time was not fully appreciated or given sufficient priority. In such a tragic event, efforts tend naturally to be directed towards helping the living, but it needs also to be appreciated that a person in a position of Mr Sayyed Husseini may suffer considerable distress while waiting for news of a loved one. In all other respects both gentlemen were grateful for the efforts which had been made on their behalf [t.483]. "Every human being has the inherent right to life. This right shall be protected by law. No one shall be arbitrarily deprived of his life". The submission also emphasised that article 6 enjoins the State not only to refrain from intentional and unlawful taking of life, but also to take appropriate steps to safeguard the lives of those within its jurisdiction. In the present case it is my view that whether or not officers of the Australian Customs Service or the Australian Navy were aware of the specific terms of the Convention, their actions demonstrated that they treated the importance of human life as paramount. This approach to the events of 8 November, 2001 is exemplified by the actions of the boarding party of the HMAS Woollongong who, while on board the Sumber Lestari, risked their own lives in contributing to the preservation of lives of the people on board the vessel. Even though members of the boarding party were aware that the ship was burning and there were obvious dangers associated with the fire rapidly spreading and there was the possibility of a major explosion on the vessel or the possibility that the vessel might sink or roll, they remained on the vessel making attempts to douse the fire, taking action to prevent the capsizing of the vessel, moving planking from the side of the vessel so as to give passengers access to the water, assisting passengers into the water and remaining to ensure that passengers were able to abandon the vessel for the water in reasonable safety. In addition, actions such as those of Officer Mahoney on the Arnhem Bay in continuing with mouth to mouth resuscitation, even when a face mask could not be located, showed a strong desire to do everything possible irrespective of any risk to himself. On the other hand, this case has highlighted the fact that people smugglers may demonstrate scant regard for human life. In this case those involved in the people trafficking activity were prepared to place a large number of persons on a leaking vessel with little shelter, inadequate food, unsafe life jackets and no life boats. It was contended on behalf of the Commission that the Commonwealth had not taken sufficient positive measures to protect the lives of asylum seekers upon the Sumber Lestari prior to the fire starting on the vessel. It was suggested, for example, that Lieutenant Commander Heron could have launched the second tender (the LUB) at an earlier stage and before the fire started. Lieutenant Commander Heron in his evidence, however, pointed out that he had limited resources to support both the boarding party and have the LUB in the water. It was also contended that the RHIB should not have returned to the HMAS Woollongong with only the boarding party and one other person, but rather should have picked up other persons from the water first. While these points may appear to have some academic attraction, the practical reality of the situation, in my view, called for the actions taken by the Navy in order to ensure that there was not great loss of life. If the boarding party had not been properly resourced, the Sumber Lestari may well have capsized or may have sunk with many passengers still on board causing a large number of deaths. If the RHIB had not been returned to the Woollongong without delay, the officers who were returned to the vessel would not have been able to assist generally with the rescue efforts and there would have been further delays involved. In addition, it was particularly important to ensure that the RHIB was not capsized at that early stage and was able to save persons from the water in a safe manner. If the RHIB had been capsized, there would have been very major problems encountered in the rescue operation. The operating instruction relating to this action, which was applied, appears to be designed to maximise rescue efforts by ensuring that these are not hindered by having to rescue the rescuers. In this context it should also be noted that the speed with which all on board the Sumber Lestari were placed in danger could not have been reasonably expected. It would appear tht the Sumber Lestari was the first of such vessels involved in people trafficking to Australia to be affected by an explosion and sudden destructive fire. Indeed, while attempts to sabotage the boat may have been expected, if the fire was deliberately lit and not caused by some unknown and unusual source, then whoever lit the fire must have acted in a remarkably reckless or stupid manner both in relation to his or her own life and in relation to the lives of all on board. It was contended on behalf of the Commission that if vessels being operated by people traffickers are to be intercepted, Naval and Customs vessels involved in such interception should be well equipped to deal with potential incidents, possibly involving large numbers of persons being forced into the sea. It was submitted that essentially the two Australian vessels were inadequate for this purpose in that the Arnhem Bay carried two RHIB's and the HMAS Woollongong only 1 RHIB and a LUB which was relatively ineffectual for the purposes of rescuing persons from the sea. It was further noted that the Arnhem Bay was licensed to carry only 28 persons and the HMAS Woollongong 30 crew members and approximately 66 other persons. The total capacity for both vessels, therefore, was 124 persons, less than the number of asylum seekers rescued from the Sumber Lestari. While it is possible that as Lieutenant Commander Heron suggested in his paper entitled Observations and Recommendations [Exhibit "21"] the HMAS Woollongong could handle more than 66 passengers, the fact remains that in the context, both vessels were relatively small. While the evidence in relation to operational matters at the Inquest hearing was limited, there was a reference to the possibility of other "assets" being available to assist in the interception of the Sumber Lestari. Without detailed information in relation to resources available to the Australian Customs Service and the Australian Navy, it is not possible to make specific comments or recommendations in this context, but it is noted that for the purpose of the interception of major people trafficking activities, there are obvious benefits in using larger vessels with a number of tender vessels suitable for conducting rescue operations. Last updated 19 May 2003.